Source: CICH graphic created using data adapted from Statistics Canada. 2006 Aboriginal Children’s Survey. http://www.statcan.gc.ca/pub/82-003-x/2013004/article/11776-eng.htm -accessed August 22, 2017. 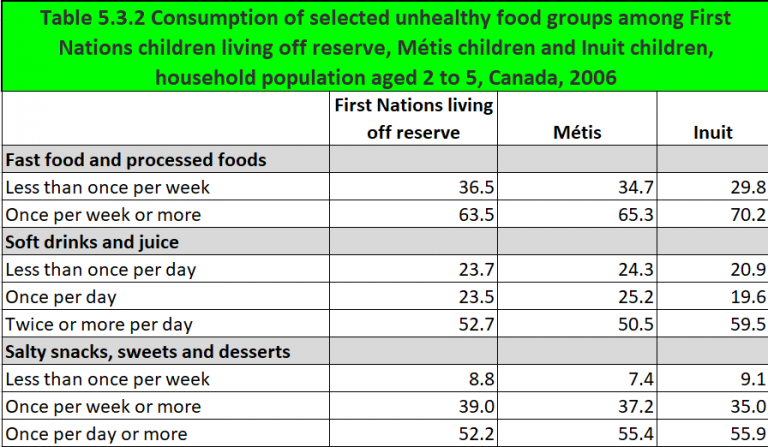 In 2006, over 60% of First Nations children living off reserve, Métis children and Inuit children aged 2 to 5 ate fast or processed food once a week or more. Soft drinks and/or juice were consumed by over 50% of First Nations children living off reserve, Métis children and Inuit children aged 2 to 5, twice or more per day. Twice or more is over double the once a day consumption rate. Over 50% of Inuit, First Nations children living off reserve and Métis children aged 2 to 5 ate salty snacks, sweets and desserts daily. 1See for example, Willows, N.D., Johnson, M.S., & Ball, G.D.C. (2007). Prevalence estimates of overweight and obesity in Cree preschool children in northern Quebec according to international and US reference criteria. American Journal of Public Health, 92(2), 311-316; First Nations Information Governance Centre (FNIGC) (2012). First Nations Regional Health Survey (RHS) 2008/10: National report on adults, youth and children living in First Nations communities. Ottawa: FNIGC.